I have covered two of the reasons for believing that Vermeer is truthful to real appearances: the minutely accurate depiction of actual pieces of furniture, paintings and maps, and the fact that the architecture and decoration of the room is indeed characteristic of 17th century houses in Delft. The third reason has to do with the coherence and consistency of Vermeer' s rendering of the geometry of the room, and the fall of light and shadow. I have already mentioned the regularity of the patterns of floor tiles. As for the lighting, Arthur Wheelock has argued for example that the pattern of illumination in 'The Music Lesson' is illogical, and that Vermeer has moved the positions and angles of shadows for compositional reasons.40 Wheelock thinks that the shadows of the virginals' legs are closer together in the painting than they would be in reality, and that the shadow of the body of the instrument has been omitted. "That direct sunlight enters the room", he says, "is clear from the bright rear wall and pronounced diagonal shadow falling from the windowsill. Logically, however, sunlight that would create such a shadow would form similar ones at the juncture of the windows and the ceiling and behind the horizontal frame at the top of the lower window. Such shadows do not exist in this painting." Wheelock is mistaken however in his belief that the room is lit directly by the sun. In Vermeer's Camera I describe how the dimensions of room and furniture derived from the perspective analysis have been used to build a scale model, and to make photographic simulations of several paintings including 'The Music Lesson', with a photographic plate camera in the place of Vermeer's camera obscura.41 The model was lit with lamps covered by large diffusers, outside the windows, to simulate north light. The result was to reproduce with some accuracy the pattern of shadowing and reflected light actually shown by Vermeer. It is the fact that the illumination of the greater part of the scene comes from the two visible windows that produces the double shadows seen in the painting - an effect that would not be caused, obviously, by the sun. 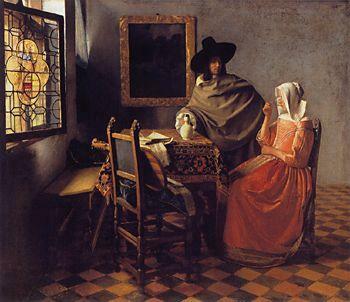 For other paintings the photographic simulations, though closely matching the pictures' perspective geometry, were less successful in reproducing the light effects shown by Vermeer. In the book I expressed some perplexity, in particular, about the pattern of light and shadow in 'The Glass of Wine' (Figure 12).42 The two casements in the far window in this picture are both shuttered, and the shadow on the far wall seems - as I thought - to strike upwards from the top of the frame. The bench below the nearer window is sharply divided across its width into light and shade; and there is a brightly-lit patch on the wall above the bench, below the windowsill. I had no explanation of these phenomena. But some of my correspondents have. Hawkins and Stevenson point out that a strongly reflective surface at ground level, like the water in a canal, could act to throw light upwards into a first - floor room. Facades and glazing opposite Vermeer's windows, if brightly illuminated by direct sunlight, could also reflect light back into his studio. In a relatively narrow street flanked by two or three-storey buildings, the direct illumination from the sky would take the form of an elongated overhead strip, again having its characteristic effects on the lighting of rooms on lower or middle floors. Both Stevenson and another correspondent, Ian Gillies, propose that the bright patch on the wall below the sill in 'The Glass of Wine' is produced by light reflected from the open casement. As for the shadow on the far wall above the shuttered casements, Gillies points out that the greenish-blue curtain is not drawn completely across the whole opening, and that there must be a triangular area of the upper fixed lights uncurtained. It is this triangle which throws the V-shaped patch of light onto the wall.45 My seeing the dark area as a shadow thrown upwards was a mistake. There seem to be two ways of investigating these matters further. One is to extend the physical model of the room with simplified mock-ups of the buildings and ground surface outside, and to make experiments in the type of 'artificial sky' which architects use to test scale models. The other is to build a computer model of the room and surroundings, and use one of the software packages now available for simulating natural lighting in architectural interiors. Two different computer models of Vermeer's studio and furniture are currently under construction, to my knowledge: one built by Jon Erland and Eric Deyerl in Los Angeles, the other by Yasuo Furuichi in Japan. The use of these models to study the lighting of Vermeer's compositions remains however a matter for future research.